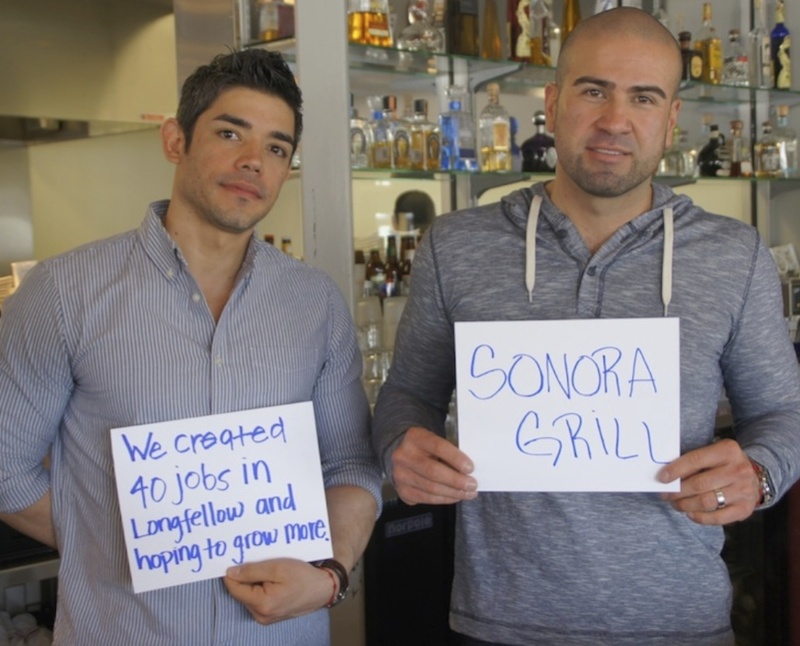 Open 7 days from 10:30 a.m.
Sonora Grill started out in the Midtown Global Market incubator as a from-scratch and innovative Mexican/South American food place with no booze and run by real Mexicans—two young men, friends Alejandro Castillon and Conrado Paredes, both originally from the Mexican state of Sonora and both with a chef background. They were a massive success story for MGM, and within two years were ready to move on to a bigger place, and, they hoped then, a beer and wine license. Now they are an established spot on the Longfellow stretch of Lake Street, and while they still have their original menu items—more on those later—they also have that license, in fact a full liquor license and an extensive tequila list to use it on, a clever cocktail menu, a dog-friendly outdoor patio, and brunch, for which they have won a few more awards to add to all those they won in their opening years. They also have a downtown food hall location for weekday lunching. We arrived at Sonora Grill a little before 2 p.m. There were a few people in there, but it was pretty laid back. I understand this location used to be Molly Quinn’s a long time ago, and was pretty much derelict when the partners acquired it to renovate into their restaurant. They have done a good job; it’s welcoming and warm, and does have a feeling of old Mexico about it (as if I would even know what that feels like). I was accompanied by my friend Mary, who is not Mexican, but who grew up in California. California has a valley named Sonora, and a piece of the Sonoran desert, so I thought that was pretty close. We were very much of one mind about what we wanted to eat. So first a word about the menu and the specialties. The two main things Sonora is known for besides tequila, and both are available for lunch or dinner, are the caramelos, which are the Sonoran version of a taco, and bocadillos, which are Spanish- and South American-style sandwiches. I was sure I was going to go for the vegetarian (eggplant) bocadillo served with fries, but then I saw eggplant fries. Perhaps I dimly remembered that back in 2011 and 2012, when this restaurant was new, everyone was raving about those. So I decided to go for two caramelos instead (they’re small), and get a side of eggplant fries. Mary did exactly the same, even ordering the same two caramelos—a fish tempura one and a roasted mushroom one—except that she got the guacamole with homemade dipping chips for a side, and we shared both sides. Our reactions to the food were similar too. We were both, unsurprisingly, blown away by the eggplant fries, which were accompanied by a pinkish, mayonnaise-y sauce not mentioned on the menu. We both quite liked the fish tempura caramelo. The fish was fresh, the tempura was perfectly crisp; what more could you want? I should describe a caramelo because they’re quite different from the usual crunchy, iceberg lettuce-adorned fast food. These are served open face, and most are priced at just $5.00 so you can try several at a sitting. The tortilla for most of them is corn, but not refried, so soft. It has two tortillas, so that it’s possible to roll it or fold it and eat by hand. I, of course, used a knife and fork like some kind of English person. Unlike the bocadillos, which are a little mysterious if all you have to go on is the menu, the caramelos’ ingredients are fully described on the menu. Fish tempura, for instance, includes chimichurri aioli (this could be what the eggplant fries came with!) and roasted red peppers. The roasted mushroom caramelo sits the mushrooms on a bed of avocado mousse, and has onion, poblano pepper, and pickled carrots. We were both a little bit underwhelmed by our two other choices; the roasted mushroom caramelo was OK, nothing wrong with it. It was just not that special. Also the guacamole was nothing to get excited about. Mary even thought it might be store-bought, but the menu does claim everything is made from scratch. It comes with homemade tortilla chips which are not too salty (yay!) and very robust. We had been tempted to try the elote, but settled on the guacamole because elote (corn on the cob, but souped up a lot) is hard to share. My theory is that perhaps they make the guac fresh for dinner, so if you have a late lunch as we did, you’re getting the tail end of it (well, somebody has to, right?). Neither Mary nor I were in the mood to drink this early in the day, and one lack we noticed is that the menu does not list what non-alcoholic drinks are available. We settled on iced tea. So while we’re in the critical paragraph, let’s just summarize what we think would improve this restaurant: more information on the menu. Such as: When does lunch start since brunch doesn’t end until 2 p.m.? What’s on the bocadillo besides the main ingredient? What are your soft drink offerings? Where is your coffee from? Do you even have coffee? And what IS that sauce with the eggplant fries? In addition to the dishes already mentioned, there are the brunch dishes, which include a breakfast burrito, chilaquiles and mollettes, which are beans, eggs, cheese and meat served open-face on a baguette, or a meal-sized house salad, nachos, quesadillas or Argentinian pork empanadas. For dinner, there are a couple of extra caramelo offerings, plus paella, ceviche, flautas with safrito chicken, roast chicken, pinchos (skewers) and a couple of interesting vegetarian choices, petacones, and a meal-sized celery root salad. I didn’t notice any desserts on the menu. Perhaps they don’t do much dessert in the Sonoran desert. Perhaps that’s what the mezcal is for. Two final important notes—they don’t take reservations, and they don’t take American Express. I’m OK with that. Go for the impressive attitude, stay for the eggplant fries.